Hopefully all is well back at the Playground and I won't return tomorrow night to find that Parsnip has been terrified out of his fluffy white fur. They were donated to the toy box by our lovely playmate Viv. Made by Visible Image and they've never been opened (I think Viv won them), although it's only fair to say that they did sit on a shelf in Viv's craft room for a while and the light has turned them very slightly yellow. That doesn't detract from the quality of the stamps and at £11.99 a set I think they're worth throwing your hat in the ring! All you need to do is to have entered at least one card/snippets make into the Snippets Playgound - and also leave me a comment on this post, saying you'd like to be in with a chance for a runner-up prize. I'm offering them separately to spread out the chances, so in fact it's two prizes. If you only specifically fancy one or the other (Isabella or Tala) then please say so as well. Otherwise I'll assume that either one would be fine. - and then I struggled for hours assembling the Christmas tree with all the teeny baubles, chains and such. What a fibber! It's a topper from an ancient Jolee's Boutique set called 'Christmas Tree' - and I added three of the extra stickers they also included in the set :) Easy peasy and a bit of a cheat I think! This fortnight's challenge over at Cuttlebug Mania is 'Bling' - just add diamonds, pearls or anything else to 'bling up' your creation. We just ask that you use a manual die-cutting/embossing machine and also let us know which product(s) you used. The sponsor is Yours or Mine Paper Crafts. I decided to try out a new (to me) technique - making a dress from one and a quarter doilies. There are lots of instructions to be found on the internet, HERE 'S a link to the ones I followed. I haven't added a sentiment, a lot of folk seem to make these as wedding cards though. And most people make these dresses using small paper doilies without going to the trouble of die cutting their own - but as this is for the Cuttlebug Mania DT I wanted to make my own :) Besides which, I'm not 100% sure just where my ready made doilies are hiding right now! I think this is a lovely theme over at Cuttlebug Mania - most of us like a bit of bling now and then so why not come and play? I did mention last week that I'm away for five days over next weekend, at a school reunion to be exact. There's usually about 200 or so of us there, although of course we have our own special smaller groups of friends within that number. There will be a lot of chatter, making merry, dancing, eating, quaffing a little wine - and not a lot of sleep or spare time to blog. So, once again this is a two week run for the Playground - but watch out next Sunday (31st May) for a scheduled update with a little extra prize of course. My snippets card for this week really stretched the word 'snippet' and only the black 'frame' is a snippet. The little scene started off at about A5 size but I kept trimming the thing down once it was finished and it ended up at 3" square :) Tee, hee. Right, straight onto the weekly picks, or my weekly headache! I love every single entry and would love to pick you all each week - but I guess that then defeats the object - plus you can always browse through last week's thumbnails of course. I picked this card, made by Nessa, as I think it's absolutely perfect! 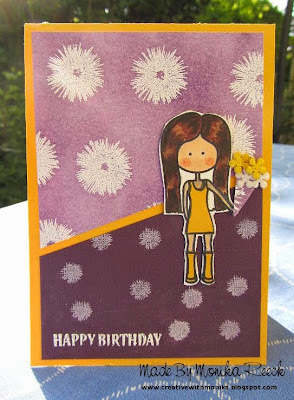 A fabulous design, wonderful colours, great use of snippets and beautifully made. Just stunning. And here's another card which totally blew me away - made by Greta - and just so soft, pretty and well designed. This card went straight onto my 'picks of the week' list, and I just hopped back to pick up the image and link over at Loll's. Did giggle when I spotted a comment left by Darnell that the girls in the Playground would swoon - we did, we did! 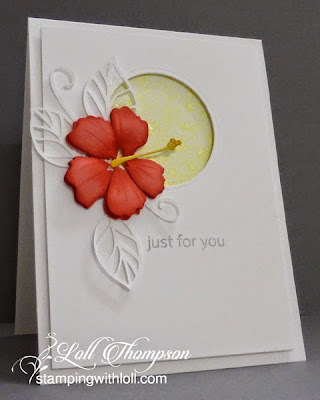 How clever of Loll to shape and layer up the hibiscus for beautiful dimension! 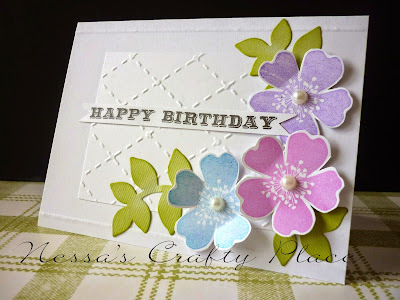 I just love the CAS look of this beautiful card as well, made by Lindsey! So fresh and a perfect way to use up little snippets too. Hazel of My Card Attic brought two cards to show, having been encouraged by our lovely playmate Mary H. One is above and for the other one do please hop over to Hazel's for a peek. Absolutely beautiful! And finally Annie hopped in with this absolutely gorgeous card. I just spent time earlier browsing back through Annie's blog admiring her beautiful colouring and the cards she makes. A very talented lady! Congratulations Jenny! I've checked back and it's a good few months since you last were picked by Mr Random - but I do still have your address and will post your prize off to you this coming week! It's a Lavinia 'Flower Fairy' stamp, a pack of Ranger 'Mini Ink Blending Tools' and also (not so easy to see at the bottom of the photo), an Inkylicious 'Mountain Valley' stencil as I used on my card (even though I chopped a lot of the card down :) You can see more about this really cool product HERE - what I like about it is that you can use it four different ways. Some of you, Hettie in particular 'cos she won an identical stamp plus a stencil, will remember that I offered the same Lavinia 'Flower Fairy' stamp here in July 2013. I just totally forgot I'd offered one previously when I was putting together the template and blending tools as a prize and ordered a 'Flower Fairy' stamp as well. But, of course, you can opt for some and not all of the prize if you wish! The Snippets Challenge will run for TWO weeks and the Playground gates will close at 11am UK time on Saturday 6th June. The gates will open again at midnight UK time on the same day. Maximum of three entries and please say 'Yes please' (or similar) in a comment if you wish to play and be a possible winner of the prize. As there are three items, you might only be interested in one or two of them. If so, then do say so in a comment and I'd do a second/third draw for the other item(s) if you win - but, all three items are up for grabs as one prize. Do remember that it's Rudolph Day tomorrow over at Scrappy Mo's! It runs until the end of the month and is a great way to get a little head start on those Christmas cards. This is also for Craftyhazelnut's Christmas Challenge Extra for May, where it's always 'Anything Goes'. 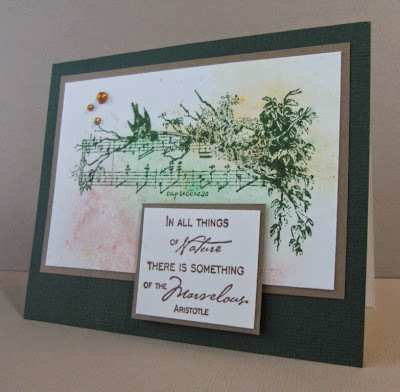 A fun challenge over at Less is More this week, it's 'Hello Sunshine'. Right now, as I type and schedule this post, it's piddling down with rain and it would be just wonderful to get a glimpse of the sunshine! My 'in-house critic' doesn't like the drabness of the Neenah card and thinks white would have been better. Maybe we're both wrong and cream would have been good? I only recently got my first Uniko stamps, this is my second set and I'm absolutely hooked. I love the designs, quality of the photo polymer with a perfect image every time, brilliant service from Bev - and also the fact that they come in DVD cases (like SU's unmounted stamps). Love, love Uniko!! My first set (thanks to the generosity of a sweet blogging friend, mwah!) will make an appearance soon - it's under wraps at the moment 'cos I used it for some DT work. My snippets card today has absolutely nothing to do with the prize for this coming week :) It's for the current challenge over at Merry Monday which is 'Stencils'. Secondly, I do like the Imagination satin card stock, and it isn't too slippery for stencil paste either. However, it's black on one side and white on the other - which means that, when trimmed, you end up with an outside line of white showing. To cover this I just ran a black Whispers marker round the edge before layering up. And moving swiftly onto the picks for this past fortnight, which was a double headache in a way as you might guess. But, having the Playground open for a two week run did actually help me enormously, with us being away and all that. In fact, I'll need to do this again in a week or so as it's my school reunion very soon and I'm lucky if there's even time to sleep, let alone blog! I'm away for five days this time too :) But, this coming week in the Playground is just one week! 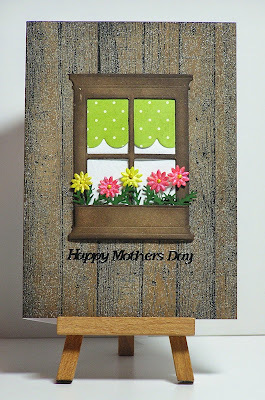 I totally love, love this card - made by Cathy R - the woodgrain background and that beautiful window with the perfect window box of tiny flowers are just fabulous! 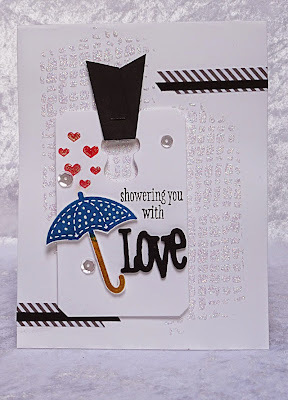 This is one of the most elegant cards I've seen in a while, it was made by Ann, and it's just stunning! 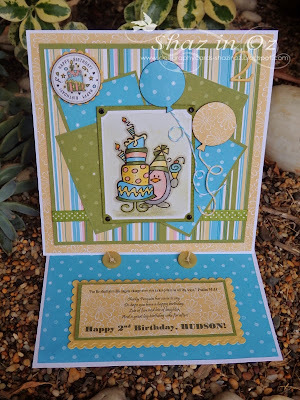 You truly should hop over to Kathy T's and see the inspiration photo that Kathy used for this fabulous card. Such a clever working in of the key elements - and squeal, look at the teeny flowers! I could go on forever with picks, but have kept this to four as I need to do a few prize draws this week! Don't forget that the thumbnails are still showing if you haven't already had a browse HERE. How cute is this, made by Irene Mendes. And we also have a new playmate called Vibula, over on Flickr HERE. As I've said before, I can't copy and paste images from Flickr so the best I can do is the link above. And now onto the winners of the main prize for the last couple of weeks, the Sheena Douglass 'Simply Sweet' stamp sets. Well done girls, I do hope you have fun playing with your prizes - I have your address already Janis, but could you please drop me an email with yours April - to di_wray@hotmail.com. Thanks! The prizes will be on their way this week. And next, the four STIX2 runner up prizes. For these I didn't go through all the rigmarole of copying, cropping and then pasting each Mr Random result, although I did actually use the generator. Our winners are: #39 Jane W, #20 Kathleen, #55 Sarn and #50 Lucy. I have all of your addresses girls and will post the STIX2 goodies of to you ASAP. The Snippets Challenge will run for one week and the Playground gates will close at 11am UK time on Saturday 23rd May. The gates will open again at midnight UK time on the same day. Maximum of three entries and please say 'Yes please' (or similar) in a comment if you wish to play and be a possible winner of the prize. Do remember that you should also link back to the Playground in your blog post to be eligible for the draw. A short list of 'ingredients' today - for a change! Hindsight being 20/20 vision, perhaps I should have masked off the sentiment and even the dragonfly before stamping the image. Next time maybe! And as is often the case, I made an additional card exactly the same whilst at it. Uncle Charlie's funeral went well on Friday and was indeed more of a celebration of a long and full life. Remember that I mentioned he was a POW in World War II? And was a captive for almost five years? Well, we discovered from the family that he and his wife very recently had to go into a nursing home - after Charlie had a minor stroke and couldn't continue to look after his beloved wife Jessie at home. Within a very short time, Uncle Charlie plotted their bid for freedom and they were caught trying to 'escape' through the kitchen which had a back door to the outside world - the rotten postman snitched on them! That's my DT card for Cuttlebug Mania - why not come and join in HERE. This fortnight we're sponsored by Digi Scrap Kits (loads of lovely Clip Art to be had!). I'm sure a few of you are aware that Lucy and some of our other much loved playmates suffer from debilitating ME/CFS and other related illnesses. 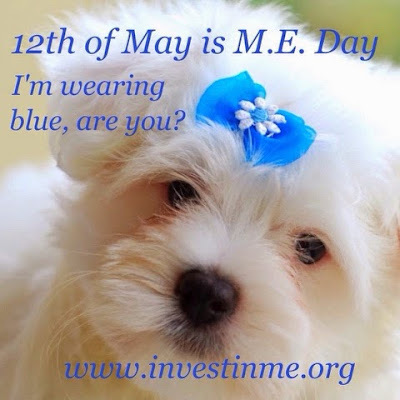 If you're fit and full of energy today - cherish every moment, oh, and why not wear something blue too? The lovely people at Stix2 sent me four of these little packs to give away. Each one contains a packet of tiny sticky pads, a tape runner, a glue stick and a really handy 'Pick Up Pencil', which is so useful for picking up little gems etc. To be in with a chance, all you need to do is to have at least one entry in the Mr Linky on last Sunday's post HERE. You have all of this coming week if you haven't already played. Then, just leave a comment here saying you'd like to be in the runner up draw - of course if you already said you want to be in the main draw you can also enter this one as well! Now, I thought there might be a little complication with posting these packs outside the UK. I've checked with Stix2 directly and they post the glue sticks overseas, they go on white and dry clear and are non-flammable - so you can all play along too, no matter where you live! The notebooks can be had from from eBay HERE. The original place I bought mine from on eBay is now out of stock so these are a tiny bit more expensive. I know that I was given a tipoff where else to find the little books to cover, needless to say I've lost the details! 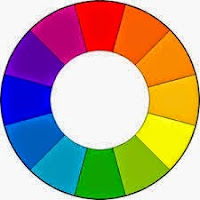 And, the twist is that you have to use colours which are opposite to one another. Sadly, Fickle Phoebe as we called her, didn't reappear the following year - nor did the seeds we collected come to fruition. But the fabulous plummy/purple flower has stayed in my memory ever since - much deeper and vibrantly coloured in real life as I already said.